Seeking feedback regarding Pantera-Electronics products, and the pros and cons of using them vs the stock components. As always, thx for a great forum. Just wanted to hear your experiences and feedback on Pantera Electronics products. Manu of them looks really nice, but definately also comes with a heavy Price tag. Are they worth the money? And also whats your opinion on shifting to PE product vs keeping the car stock? I’m definately considering PE, but are they are very pricy. Top of the line products. You can't go wrong with PE products, and you won't find better customer support. The offerings from Pantera Electronics are impressive. Their fuse panel is likely its flagship offering. But I have been able to mostly get by with with our stock electrical system. Ceramic fuses for the Pantera are available on eBay for next to nothing and one of the first things I do is I replace all of them on any car that I get. This provides fresher contact points on what might be oxidized surfaces. Adding relays for the radiator fans, headlights, and AC condenser fan significantly improves the performance of those subsystems. Beyond that the original Pantera electrical system is pretty impressive to me. 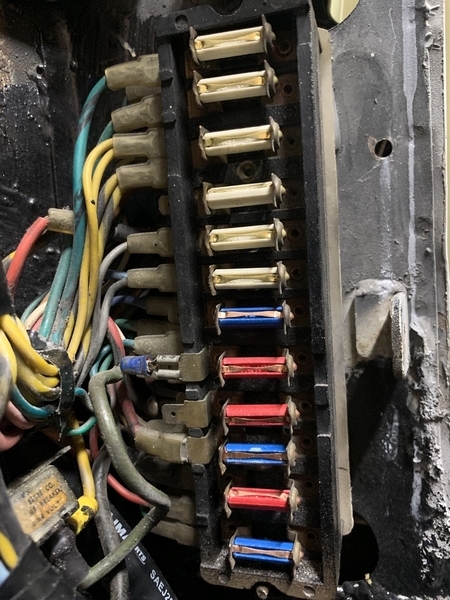 The stock wiring is good quality and looks brand new if the original sheathing on the harness is removed for maintenance or restoration reasons. Thus my vote is to stay with the mostly stock electrical system unless there are compelling reasons to go with aftermarket components. Best in the business. Good luck with your project. First thing I replaced was the fuse panel from PE. In my opinion, the original fuse panel with the "clip in" ceramic fuses are subject to becoming loose, potentially arcing, etc. Additionally, the ATO fuses are available at any store selling auto related accessories should it become necessary to replace fuses. The PE panel also offers additional slots for electrical expansion and open fuse warning lights. I just replaced my original fuse panel with the Pantera Electronics version two weeks ago...it is a quality item. ATO fuses, integral power window fuses, and additional fused outputs were all compelling reasons to upgrade. I have many of P.E.’s products. They are well designed, installation instructions are well written and the prices are very reasonable, considering the time and effort it takes to design/produce them vs. the size of the market. If you think they’re expensive...you’re wrong! I have a Mangusta and PE didn't (then) make a version of their Pantera Fuse Panel for the Mangusta. I called Jon Haas and discussed what I wanted. He agreed to build a new panel specifically for Mangusta (which he now list on Ebay). He communicated with me along the way (I'm in UK) to make sure I got exactly what I wanted. The finished product is absolutely first class, delivered on time to the price quoted. I only wish others supplying our hobby could come close to what Jon provides in both aspects. i couldn't recommend him enough. No, it isn't cheap but then the best never is. I am very satisfied with my PE products. I have the daytime driving LEDs, the EIC (ignition controller) and the green LEDs for the meters. The EIC is pretty brilliant with all its features, and the latest version even has some more stuff, like engine shut-down at low oil pressure (wish I´d had that, when one of the hoses to the oil cooler came off!). Pantera Electronics is 1st rate! Superior products and EXCELLENT customer service!!! As already stated, the original wiring in the Pantera is pretty good, but there are some definite short-comings that could cause anything from difficult to diagnose electrical glitches to burning your car completely to the ground! 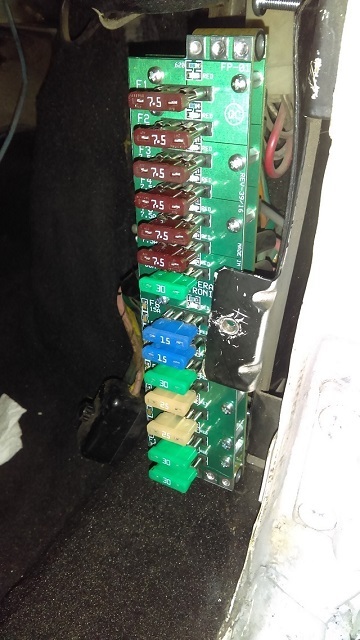 Excessive current and heat load on switches in the dash because ALL current runs through the switch, creating a fire hazard. I've heard more than one tale of a melted headlight switch after driving a few hours at night. ATO Fuse Panel: I've installed a relay kit to take the load off of the switches, and I have the PE ATO Fuse Panel which is FANTASTIC! I didn't have any electrical glitches, but wanted to upgrade my electrical system to be more bullet-proof. Many have reported ATO Fuse Panel upgrade alone solved a slew of electrical gremlins. One of the best features is that there's an LED that lights up if a fuse is blown! No more pulling all the fuses one at a time to test a circuit when diagnosing an electrical issue. Electronic Ignition System (EIS): I have this too. Another top notch product. 100x faster than an MSD. Will fire a wet plug. Great safety features to save your engine should you lose oil pressure. Auto-retards timing on startup. Will auto-shutoff AC when you stop it to get back that horsepower when needed most. Many other great features. Console Switch Controller: I have it, but haven't gotten around to installing it yet. I look forward to the auto-open/close functionality that this will add to the window switches. LED Gauge Lighting: Jon didn't have these available when I converted my instruments to LED bulbs, so I managed to source a decent set of LEDs through trial and error. I recommended Jon add these to his product offering years ago, and he has. I would definitely buy these if you want to be able to see your stock gauges at night. Temperature Gauge Corrector: I have one from Thomas Tornblom in Sweden - he doesn't make them anymore - so I highly recommend this product to get an accurate reading of your fuel level. All of the PE upgrades I've made to my Pantera are in the interest of reliability, safety and performance. They perfectly compliment and enhance the existing electrical systems while maintaining a stock appearance. PE also offers many additional and innovative products too that might be deemed more modern or make your car appear less original, but it's up to you what updates you choose. Cost was a concern to me initially as well, so each year I added one additional PE product that was on my list. This mitigated the pain-factor of placing one big order. And, once I received my first product (and the personal support from Jon that came with it) I was convinced it was well worth the price. I plan to add more of their products in the coming years. Anyway, all of Pantera Electronics' products are first rate! You will not be disappointed. I purchased and installed the Pantera Ignition Switch Controller along with a led push button for the starter. I also utilized the optional ignition interlock for woodbe thieves. What a great product and great service. I also have received many positive comments on the push button ignition. One thing to keep in mind - and this is my OCD talking - if you have stock gauges I would recommend going with a "green" led push button switch to match more with the gauge colors, etc. I purchased blue (because I like blue) and kind of now think the green would have been a little better for matching the rest of the interior lighting. Just my two cents on color and my personal opinion. Jon is a great guy with tons of Pantera experience and top quality products. I would not hesitate to buy any of his stuff. I think I gotta look into Fuse panel and HMC and perhaps ignition. When I mentioned the equipment was pricy, it wasn't disrespect for the equipment, it was more to understand if it was worth money, since I live in Europe and buying e.g. Fuse panel at 288$ will end up costing approx 450$ due to shipping, import taxes and administration fee. So the amount is slightly different for me than people living i US....sadly. First class. 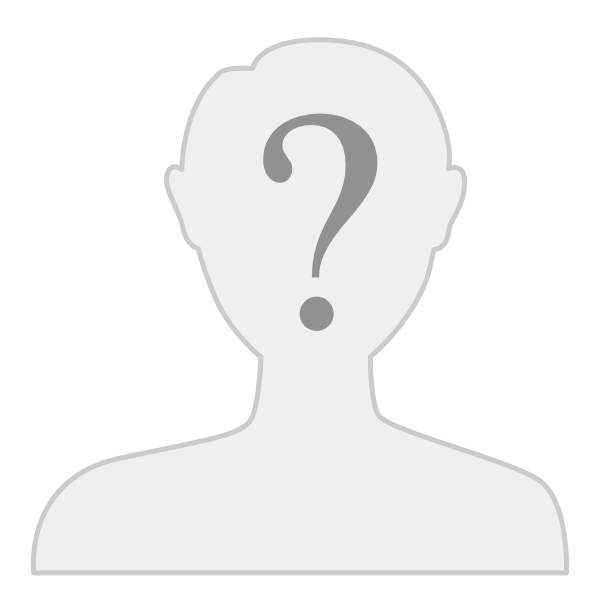 We've used perhaps more of his products than others, never a problem, never an issue, tech questions? He picks up the phone, answers emails, what could be better! When a client says this or that about a price now-a-days, I remind them they have a 6 figure car. Why take a chance & let it burn DOWN because of original 50 year old wiring & arching fuses. These cars DO catch fire. Second generation doing Pantera since 1977 I know of what I speak. We just set yet another world record... 145k for a chrome bumper car sold live stage for the whole world to see. With regard to Jon, relatively speaking his prices are modest, quality is parexcellent. PM sent about help with shipping---I have 2 orders going to Europe soon.